LAGNIAPPE is a large volume (28’ beam) 136’ Tri-Deck MY. She has just completed an extensive refit which included overhauling the generators, a W-6 service on the main engines, full paint job from the bottom of the keel to the top of the mast, updated electronics and A/V system and interior soft goods renewal. Her original construction was completed under close supervision and only the finest materials and equipment available at the time were used. United Yacht Sales New Jersey would love to guide you through a personal showing of this 136' Intermarine Motor Yacht 1999. 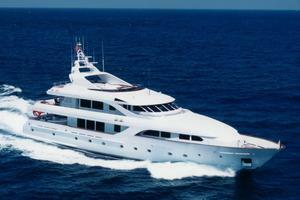 This yacht for sale is located in Fort Lauderdale, Florida and priced at $11,900,000. For a showing please contact us by filling out the form on this page and we will get back to you shortly! Anchor Chain: (2) 350 ft.
Bar area forward with black granite counter tops. Bar contains (1) single sink, (1) margarita machine, (1) ice machine, (1)fridge, shelves and cupboard space. LAGNIAPPE is a large volume (28’ beam) 136’ Tri-DeckMY. She has just completed an extensive refit which included overhauling the generators, a W6serviceon the main engines, full paint job from the bottom of the keel to the top of the mast, updated electronics and A/V system and interior soft goods renewal. Her original construction was completed under close supervision and only the finest materials and equipment available at the time were used. Exclusionsinclude all of Owner's personal effects. "All speeds, capacities, consumption, etc. are approximate or estimated; measurements can also be approximate.Specifications are provided for information only and particulars herein obtained from sources believed to be correct, butare not guaranteed. Buyer should instruct his agent and/or surveyor to check all details for accuracy. Offered subject toprior sale, price and/or inventory change, or withdrawal from the market without notification."